Google has promised to fix a potentially embarrassing Calendar privacy flaw for those who use the service to create personal reminders, website The Verge is reporting. According to Terence Eden, who first reported the flaw, putting a person’s email address in a Google Calendar subject line will automatically result in that person getting an automatic invite to the “event” without prompting or asking permission. No email notification is sent unless the calendar item is deleted. You can see the glitch in action in the video below. 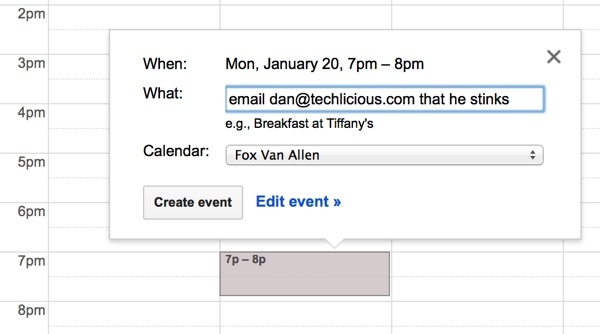 Clearly, Google intended to create some kind of smart calendar functionality here – a simple way for you to collaborate and add people to events. Ultimately, though, the feature isn’t smart enough in the way it behaves. As Eden points out, creating a reminder entry “e-mail husband@example.com with divorce details” would add the event to both your calendars – likely not what you would want to happen. Google is “actively working to fix” this issue, says The Verge. In the meantime, Calendar users should be aware that this functionality exists. Avoiding problems here is pretty simple: Just keep email addresses out of your Calendar subjects and you’ll be fine.